Gardening has become a low priority in the current tough economic climate. Recent research shows that a staggering 47% of us spent nothing at all on our outdoor areas in 2010. Some people have saved money by going from green to grey – covering their gardens in concrete or decking to cut down on the expense of planting. However, there are plenty of ways to cut the cost of gardening and still have a beautiful garden you can enjoy. 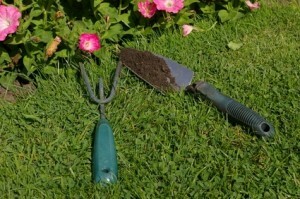 Here are our top tips to help you keep digging your garden without digging into your pockets. Finally, a good way to cut costs when gardening is to make a friend of a fellow gardener. That way, you can swap your unwanted seeds and plants for those you like and profit from bulk buy discounts when purchasing supplies and plants for both your gardens. If you have any hints or tips on saving money when gardening, please add a comment below and share your ideas with our readers. Tagged garden, money. Bookmark the permalink. Greetings I discovered your blog by mistake when i was searching Yahoo for this issue, I need to point out your website is totally useful I also like the theme, it is awesome! Found your blog through Google. You know I am signing up to your rss.